I was provided with two complimentary Armpocket bands (one for personal use and one to give away) in exchange for my honest review and feedback. All opinions are my own. Like most runners, I am fairly particular about my gear. From the right shoes to the perfect socks, to the water bottle that fits most comfortably to the nutrition that fuels most efficiently. Once I find something I love and that works, I’m pretty hooked. I have been wearing an Armpocket armband for almost three years, now. A friend made the recommendation and I decided to give it a try, simply because I needed a convenient place to comfortably tote my phone and earbuds, and any other little things I might need along my way. Armpocket offers a line of armbands in a selection of sizes and functions. 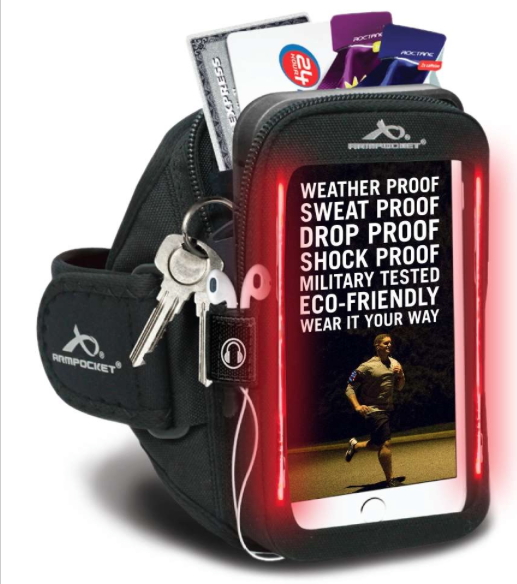 From the thin, sleek “Racer” model to the larger, carry-all “Mega i-40“, Armpockets are a great way for runners to carry phones, mp3 players and other little necessities with them when they hit the road. All Armpockets are made from recycled plastic fibers and natural bamboo rayon. This makes them not only eco-friendly, but also moisture-wicking and resistant to bacteria, mold and mildew. The curved portion of the band is memory foam, and separated from the actual case by a waterproof barrier, to protect your electronics from sweat, rain or other types of moisture. Keys, cards and cash fit neatly into a deep interior pocket and the whole case zips up to keep everything safely stowed. I currently use the Ultra i-35, which is a great fit for my iPhone 7 with Speck case. My newest model is a gorgeous neon yellow, which has reflective edges to help with visibility. There are two holes at the bottom of the Armpocket through which I can easily thread my headphone wire, when I feel like listening to music or a podcast. And I can also fit in a Gu, a key, my ID and a credit card or cash, without adding any additional bulk. This comes in handy, especially at races where I need to bring a few things with me and don’t feel like using or don’t have access to gear check. I know my phone is protected from rain and moisture (a big concern with the humidity we regularly face), as well as any dirt or mud (trail or obstacle runs, anyone?). Additionally, the case is fairly simple to clean – I throw mine right in the washing machine on cold cycle, and then air dry it. What I like most about the Armpocket line of products are the wide sidebands on the adjustable straps. This helps keep the Armpocket balanced and fitted on my upper arm without any flipping or flopping. Once the velcro is fastened, there is no sliding or any other movement, even over clothes! My Armpocket is, and will continue to be, one of the essentials I grab on my way out the door for my runs. Now, for the fun part. We’re giving away one Armpocket Flash (color black, size medium) to a very lucky winner. Not only can the Flash accommodate devices up to 6.5″, but it also features multi-mode LED lights for better visibility in the dark. Safety and convenience all in one! Enter to win this for your very own! Nice! I usually carry my phone, water bottle and car key. I need to get a ca with keyless entry because the fob is so bulky! I like to carry my keys and phone. My phone, water and my fitbit. Nice! I cannot run without my music, so an armband is critical! I just got a new phone, so I need to get a new armband. I like that this one has a zipper pocket, that’s so helpful! I always carry my phone, $5 and water. All essentials! My cellphone and some water! I am currently on the hunt for an arm band and this is a great review. Thank you so much! I’ve never used an arm pocket for my phone. I’ve used a flip belt and spi belt. May have to give this a try! I always carry my phone and my keys. I also carry nuun if I’m going out for longer than a few miles. Thankfully I can fit most of what I take in my skirt pockets. I try to run with very little. My phone if I have to and keys. This looks like it can hold a lot but isn’t too bulky. This looks like just the thing I need to run with my few necessities without them weighing me down. Compact and convenient. Nice review! I usually carry my phone; if I’m going farther, I might carry a gel. I used to always run with my armpocket. I should fish it out of hiding! I always need to have my phone and house key or car key on me. I need energy gel, my phone, keys. Wow this looks really handy with all the pockets and stuff! I can’t get comfortable with arm bands and prefer belts but this looks great for runners. Phone, keys, and wallet are the standards of what is in my pockets. Phone, keys, and pepper spray.. When I head out I have to have my keys, my phone, change for a bottle of water if I’m at the park, lip balm, and doggy poo bags- I never need them unless I don’t bring them. My phone, ipod, headphones.. and water sometimes! I carry my phone, keys and water. I need my phone, keys, water and a light if at night. I carry with me, my phone, my id and my chapstick. I need to carry my phone and my house key. And usually like to put my debit card or a few dollars in there too just in case! I have to have my phone, keys, ID and cards. I carry my keys, ID, phone, and water bottle. I carry my phone, keys, glucose monitor, and a bus token! I need to carry my keys and ID. I need a bottle of water but I like to also have my phone and keys as well when I’m running or walking. My phone, keys, and ID. I would carry my phone, inhaler and keys! My keys, my cell phone, and my water, I also started carrying an identification card in case emergencies! Thank you for the chance to enter! Phone, ID, Keys and water. On all runs I need my phone, gum and chapstick. I need to carry cash, credit card and my phone. I carry my keys, phone and water. I like to carry my keys and my phone. I need to carry keys and ID. I need some water, a phone and some “just in case” money. I carry my keys, phone, ID, money, Chapstick. I always need keys, water bottle, id, and cell phone. I really like that this band has a small zipper section for those types of items. Great for anywherre. I need to carry a key on a run. I need to carry my phone and keys. I carry phone, keys, and water bottle. I need my phone, keys, and a water bottle. I need to carry my keys, phone, dog poop bags, kleenex, and money. I usually carry my Phone and water. keys, pepper spray, cell phone! that’s about it! I need to carry my keys and my phone on a run.